Perhaps the greatest lightweight of all time, Benny Leonard possessed superb boxing skills as well as potent punching power. He fought over two hundred times and suffered only four knockouts: three early in his career and the fourth in his final fight. Born on the East Side of New York, Leonard learned to fight in neighborhood battles and turned pro in 1911 at just fifteen years of age. In his inaugural bout he was knocked out in the third round. By 1915, Leonard was working his way to the top of the lightweight ranks. A scientific boxer whose poise in the ring led observers to say fighting scarcely even mussed his hair, Leonard fought a series of no-decision bouts with Hall of Famer Johnny Dundee. 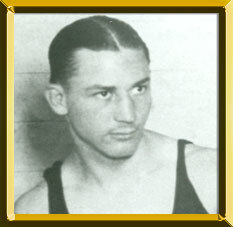 He also performed well in no-decision matches with Hall of Famer Johnny Kilbane and lightweight champion Freddie Welsh. In 1917, Leonard challenged Welsh for the title. He skillfully hammered away at Welsh, knocking him out in the ninth round. Leonard held the lightweight title for six years. In his first defense, he knocked out Kilbane, then featherweight champ, in three rounds. Leonard also successfully held several other challengers at bay. In 1922, Leonard set his sights on the welterweight crown and challenged champ-ion Jack Britton. In a well-attended fight at New York's Velodrome, Leonard knocked Britton down in the thirteenth round, then in an uncharacteristic move, hit Britton again during the referee's count. Britton was given the win because of Leonard's foul. Leonard fought left-hander Lew Tendler twice. A no-decision twelve-rounder in Jersey City was very close and earned Tendler the right to try for the title. The two met in 1923 in Yankee Stadium with nearly 60,000 fans looking on. Leonard outboxed his closely matched rival to win in fifteen rounds. Leonard retired in 1925, but hard times brought him back to the ring in 1931. He won the first nineteen fights of his comeback before Jimmy McLarnin knocked him out in six rounds. Leonard then retired for good. In 1947, he died of a heart attack in the ring at St. Nicholas Arena in New York while refereeing a match.